In the spring of 2018, TI Automotive (parent company of Walbro) released their newest version of the popular Walbro "450" pump. This new pump can be identified by the part number stamped on the side: F90000285. Many in the industry have already started calling this pump by all sorts of names like "Walbro 520" or some other random number, even though the number is not close to the actual flow rate....at all. So what is so special about this new pump compared to the current versions of the "450" pump? 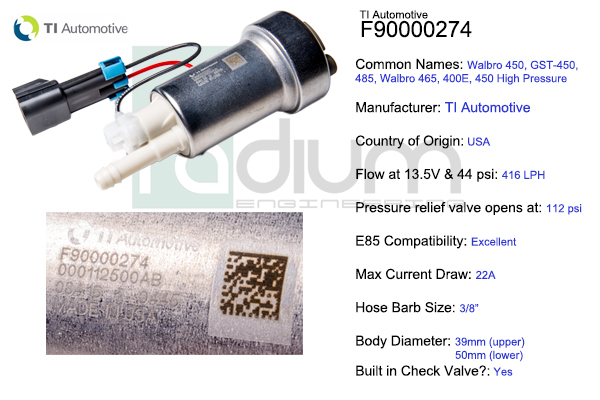 Without an official trade name, and just a hard-to-say 9-digit part number from TI Automotive, the aftermarket industry has been referring to the family of 39/50 DCSS pumps as the "Walbro 400" or "Walbro 450" or any other made-up name that has been created. At Radium Engineering, we refer to these pumps by the 9-digit part number as this is the only reliable method. Plus, the part numbers are printed right on the side of every pump. The 39/50 refers to the pump's outside diameter. It was the first to use a large diameter impeller, necessitating the need for the 50mm diameter lower section. The upper section was left at 39mm (standard fuel pump diameter) most likely to keep the pump compatible with many existing packages. The first pumps to come out were the gas-only F90000262 and the gas/E85 version F90000267. These pumps were already in OEM applications and it took time and convincing by TI Automotive employees to offer them for aftermarket use. Once released, these pumps became extremely popular. 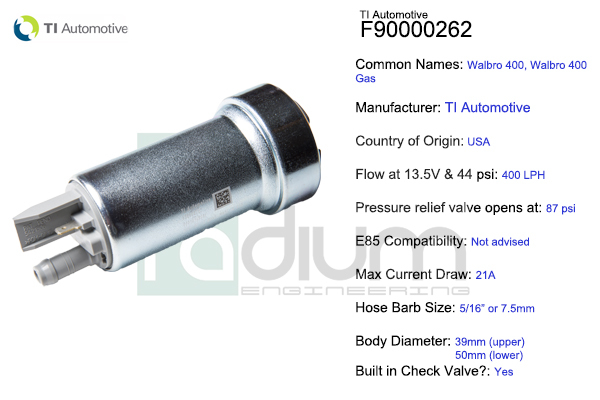 Then came a new version of the E85 pump, the F90000274. This pump was exactly the same as the F90000267, with the only change being a higher pressure relief valve setting of 112psi, versus 87psi on the F90000267. The F90000274 pump was ideal for users that were experiencing the pressure relief valve opening under high pressure and the pump flow dropping off suddenly. More information on this issue can be found HERE. We have been selling the F90000274 in Radium Engineering products for several years now. It has been extremely popular and has also proven to be reliable when installed and used correctly. 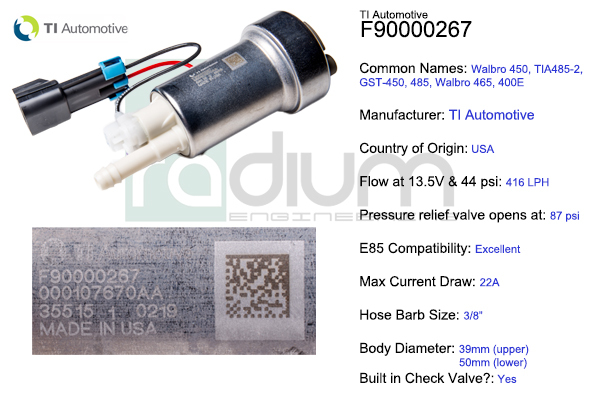 Without warning, in the Spring of 2018, TI Automotive quietly released the F90000285 pump. This new version of the 39/50 DCSS E85 pump was used by Dodge in the early Hellcat vehicles and was now becoming available to the aftermarket. This pump peaked our interest, so we decided to do some testing. The F90000285 pump has the exact same form factor as the F90000274 and F90000267 pumps, so it installs anywhere the other pumps do and will be a direct drop-in replacement. In order to figure out what exactly this new pump is capable of, physical flow bench testing had to be done. Pump testing, like dyno testing a vehicle, can result in different results depending on who is doing the testing, the equipment being used, the test methodology and the ambient conditions. So comparing pump flow results between two different sources is not advised. Our test method included testing three of the Walbro F90000274 pumps we had in stock and taking the one with the highest flow rate, as there are inherent flow differences right out of the box with new pumps. We then run the pumps we are going to test for several minutes and let them break in and heat cycle. We had only one F90000285 to use for testing, so we were not able to test several and pick the best one. Once the pre-test preparations are done, we are then ready to flow test. The F90000274 and F90000285 were tested back-to-back in identical conditions. The above graph shows the results of the F90000285 (blue) vs the F90000274 (green) flow vs pressure. Our data shows us that the F90000285 pump flows 8% more than the F90000274 pump, but in order for that to happen, it has to draw 15% more current. So it is essentially the same pump, but using more current to drive the electric motor harder. We also can see that the pump most likely has the same pressure relief valve setting as the 274 pump, because it was still flowing well at 95 psi. The new F90000285 pump may be just what is needed for some customers who are maxxing out an F90000274 pump or just want some extra head room. You get 8% more flow than the F90000274 (and F90000267), but you are paying for it with more current draw and more wasted heat being lost into the fuel. So there is a tradeoff. The extra cost of the F90000285 will also be a factor.